Nutrition is an important component of health, no matter the issues that a community faces. In the Dominican Republic, we have expanded our outreach to work with Mothers' Centers in the area and focused on nutrition. We're whipping up delicious recipes and involving our mothers in participatory education. Posted on October 27, 2016 by FIMRC and filed under Dominican Republic, Project Restauración and tagged Dominican Republic Project Restauración nutrition. FIMRC's Ambassador Program offers the unique opportunity for participants to develop and implement health programs internationally. When Ambassadors arrive on site, they are able to observe the health obstacles many populations face in the developing world. They are able to work closely with community members and FIMRC staff to plan a project to address health concerns in the community. Our Ambassador at Project Kodaikanal, Amy Patel, has been on site since early February. Working in the community, she realized that many children were not getting adequate nutrition when they were on breaks from school. Below, you will find Amy's project on keeping the children of the crèches healthy year-round. During my stay in India, I had the opportunity to participate in a variety of activities, such as helping out at local hospitals and in FIMRC’s own rural clinic. The project that I decided to initiate, though, centered on the crèches (preschools) that FIMRC had partnered with. FIMRC had already organized weekly health check-ups at each of three crèches (Nathanael, Joshua, and Mabel Crèches), but the critical issue was the drop in weight of the crèche children that had been noted over the summer break. Also, there was a lack of knowledge about nutrition and the components of a healthy diet for children, such as the number of servings of different food groups required for proper growth and essential vitamins and nutrients. This lack of knowledge on the part of the parents exacerbated the under-nutrition of their children. To improve the drop in weight seen in the crèche children over their vacation, I designed nutrition education lectures that could be repeated yearly in the months preceding the summer break. In this way, it would improve the drop in weight seen in the crèche children over their vacation. 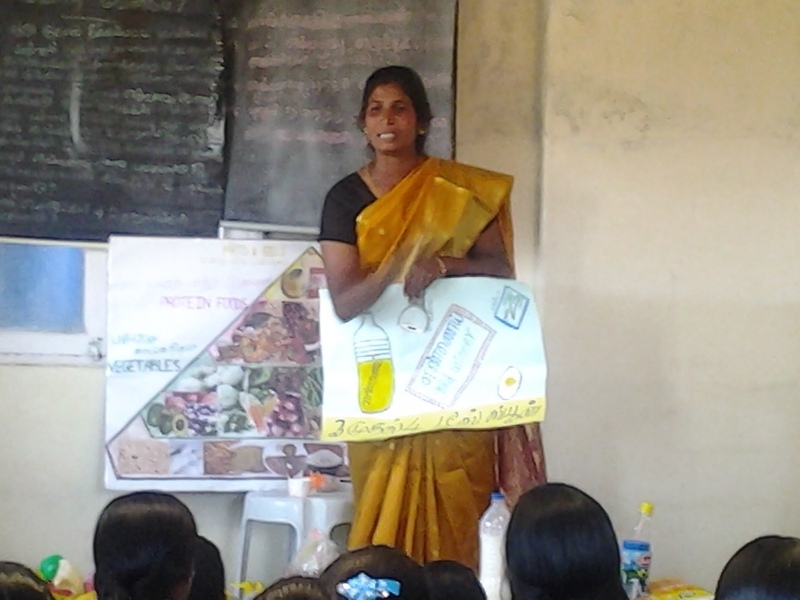 We wanted to teach about nutrition to the teachers first, who would then present the information to the parents in the monthly parents’ meetings. To teach about food groups and proper nutrition for the kids in the crèches, who are all aged 3 to 5 years, we created a large food pyramid poster that could be relatively easily carried from crèche to crèche. Through two meetings with the teachers of each of the three crèches, we covered the basics of the food pyramid and the details of each food group. We went over examples, number and size of servings, subgroupings within the overarching food group, the health benefits, and health complications arising from deficiencies in the food group for grains, vegetables, fruits, dairy, protein rich foods, and fats and oils. At the end of both of these meetings, we answered any questions the teachers had and briefly quizzed them to make sure that they had noted down all of the important points. Also, after the teachers’ meeting, I quizzed the children on where different foods were in the food pyramid so that they were somewhat familiar with it, too. 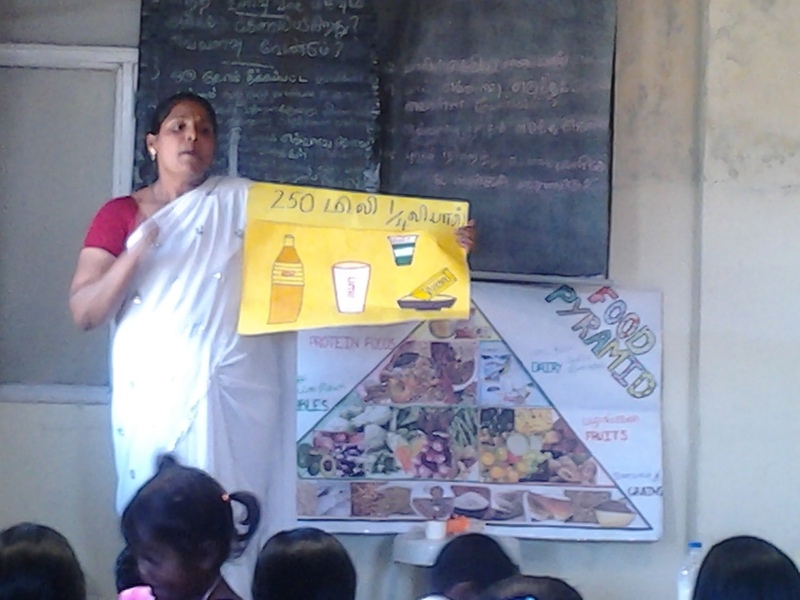 The teachers chose to present the material about the food pyramid through different creative ways. The teachers at Nathanael Crèche’s did so through a comedic skit and those at both Joshua and Mabel Crèches did so by personifying each of the food groups. Before and after each of the parents’ meetings, we distributed pre- and post-questionnaires that consisted of the same 15 questions to the parents to gauge their comprehension and retention of the material being presented. Then, we opened the floor up to any questions that the parents had. After each of these meetings, we introduced the teachers of each crèche to the food log that I had created. On this food log, the parents would be able to record what food groups their children consumed for the duration of a day for a total of four days during the summer break. In this way, FIMRC would be able to keep some track of the children’s diet when they were not at school. We are also planning a summer nutrition camp for each of the crèches in mid-May. FIMRC’s doctor will be present for routine examinations of the children and will distribute medicine and multivitamins. In this way, FIMRC does not lose track of the children for an extended period of time. We noted down the names of those children that were either moderately or severely underweight so that they could be provided with extra nutrients during our weekly medical visits to the crèches to help boost their weight before the upcoming vacation. So far, the nutrition education that we are teaching about has been taken very well by both the crèche teachers and parents. Already, we have started noticing that the teachers have begun incorporating a greater variety of nutritious alternatives in the evening snacks that they provide to the children during school hours. This is a good sign and, hopefully, the parents have changed their habits accordingly, too. I am very optimistic that this, in combination with the summer nutrition camp, will turn the tides and cause a decrease in the number of underweight and undernourished children seen returning from their summer vacation. Posted on April 17, 2014 by FIMRC and filed under FIMRC Stories, Project Kodaikanal, India, Internship Program, Internship and tagged India Internship Project Kodaikanal nutrition Crèche. Thoughts from FIMRC Ambassador Bridget McDugall. …Come again another day…or not! As I sit in the volunteer house in the city of San Salvador, again confined because of heavy rains threatening the entirety of the Central American region, I have taken a strong interest in nutrition and what it means for the people of Las Delicias. It is a problem, no doubt, that not only affects women and children here, but those at other FIMRC sites across the globe. As part of my extended internship in El Salvador, I have now decided to try and tackle this problem, albeit in a small way. While this project is still in the beginning phases, I have finally read enough information to squash three common myths associated with malnutrition. Myth #1: Poor nutrition is a result of inadequate food intake. WRONG! Before I set foot on this foreign soil, I had seen the photos we all have seen of starving children in Africa, Haiti, etc. I would question why they didn’t have enough food to eat and ponder how governments and NGOs could relieve them of their plight through the widespread distribution of food products. I now know, however, that malnutrition is a complicated web of cause and effect – and lack of food is only one thread. A combination of poor maternal health, inappropriate infant care and feeding practices, and a lack of access to safe water and sanitation represent other concerns that are themselves embedded within the web. Myth #2: Improved nutrition is a byproduct of other measures of poverty and reduction and economic advance. It is not possible to jump-start the process. Again…incorrect! Certainly, nutritional health is related to poverty. The poorer one is, the harder it is to maintain a healthy lifestyle including an appropriate diet. Nevertheless, it is possible to develop community programs to address nutritional health (i.e. the various threads that compose the web) in an impoverished community. One must be creative, and adapt measures to the resources available. Which leads me to Myth #3: Broad-based actions are unfeasible in poor countries. Despite economic setbacks, many developing countries have made progress. While malnutrition is still a real problem, decreases have been observed since global nutrition was deemed a Millennium Development Goal at the turn of the century. With this information, I plow forward with the goal of developing – or at least helping to develop before my time here is up – a nutrition program for the women and children of Las Delicias. There is much work to be done…researching, brainstorming, planning. But each day spells progress. Now, if only the rain would stop! Bridget McDugall is a recent graduate of the University of Pennsylvania and a valuable addition to FIMRC's Ambassador Program. Las Delicias is happy to have her here this fall! Thanks, Bridget :-). Posted on October 17, 2011 by FIMRC and filed under FIMRC Stories, News from the FIMRC Field, Internship, Internship Program, El Salvador, Project Las Delicias and tagged nutrition El Salvador Project Las Delicias Ambassador.